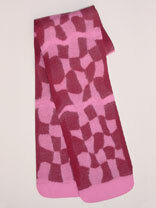 This scarf was made by weaving approximately 2" wide strips of prefelt together to create a checkerboard pattern. To weave the strips of prefelt, start at the center and work out to the edges (both crosswise and lengthwise). Weave the strips of prefelt tightly (even with a slight overlap) for tight joints. It's best to weave the prefelt strips in the order they were cut for tight joints and critical if wavy strips of prefelt are cut. Variations include cutting prefelt strips straight or wavy, varying the width of the prefelt strips (crosswise or lenghtwise), varying the color used in the weaving pattern, and leaving the natural felted edge or trimming the felted edges. Because the prefelt is woven together this scarf is thicker than a scarf made with a single layer of prefelt. The scarf was felted with a sander, fulled by folding and dropping, and finished by rubbing on a glass washboard. This scarf is made by felting, not nuno felting, because it is soley prefelt. Therefore you can start the felting with hot soapy water. Finished size: ~ 8" x 68"